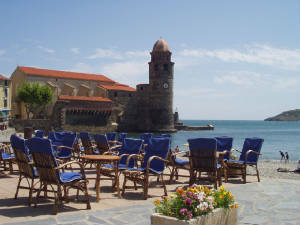 Holiday in Collioure - if you want a wonderful holiday in France then try Collioure, in the Languedoc-Roussillon. Holiday rental apartment with its south facing rooftop terrace and stunning sea and mountain views. Completely rebuilt, renovated and upgraded. This self-catering flat is in an 18th Century merchant's house, in the historic Mouré area of Collioure. 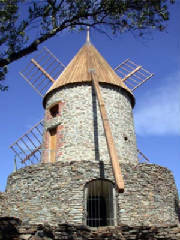 Rare in this part of Collioure, 3 double bedroomed accommodation to rent. From the terrace of our apartment in the centre of Collioure let your eyes enjoy the sweeping panoramic views, from the Mediterranean sea to the foothills of the Pyrenees. 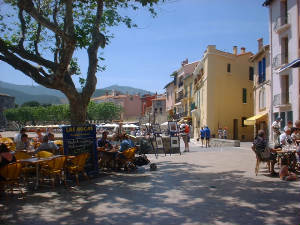 Our holiday rental situated just off the main square in the historic centre of Collioure and two steps from the Boulevard Du Boramar with its seafront cafes and beach. Prudhomie our newly renovated self-catering holiday apartment will provide accommodation for up to 6 people. Its prime position gives spectacular views both onto the famous church tower, the only one in the world to stand with its feet in the water, and into the main square where many of the towns activities take place from jazz evenings to the traditional sardane dancing. From our terrace you can see across the rooftops to the chateau and the military forts topping the peaks behind, then follow the hills down to meet the sparkling Mediterranean sea before you. Above the town there are lovely walks through the vineyards to the windmill and Fort St Elme, and further still the higher ridge of Tour Madeloc. Here you have a wonderful view of the Cote Vermeille and the French coast stretching northwards. To the south is the nearby town of Port Vendres, the main fishing harbour for this part of France but also a bustling marina with harbourside cafes and restaurants. To the north is Argeles with it campsites and seaside tourist attractions. A short train or car ride away is the regional capital of Perpignan, a fine and proud city with modern facilities and shops. It has an historic heart with many fine buildings and a strong tradition of arts festivals and events throughout the year. Further afield the Pyrenees offer canyoning, walking and skiing depending on the season and if you drive an hour or so to the south you can explore the fascinating towns of northern Spain including Dali's seaside home of Cadaques and his famous museum at Figueres. If all you want to do is relax in the sun, on the beach or on the terrace; eat simply and very well in the excellent local restaurants then just stay in Collioure, join the locals, and watch the world go by.